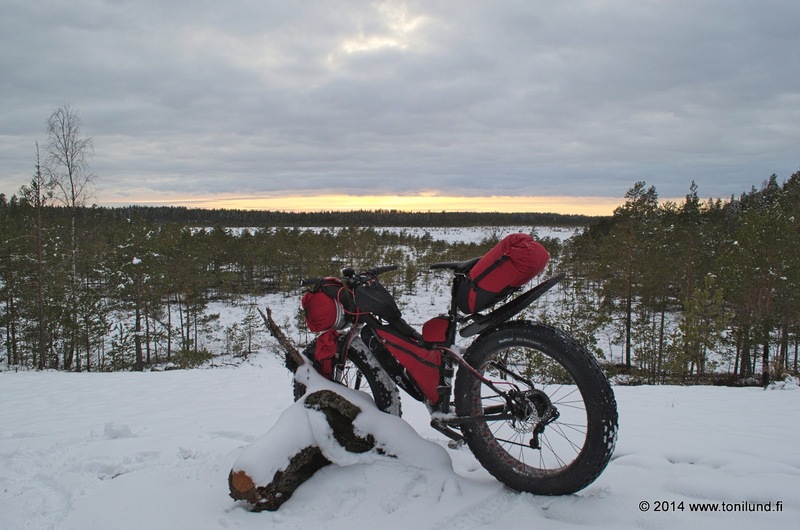 Toni Lund - Adventure cyclist: Return winter! 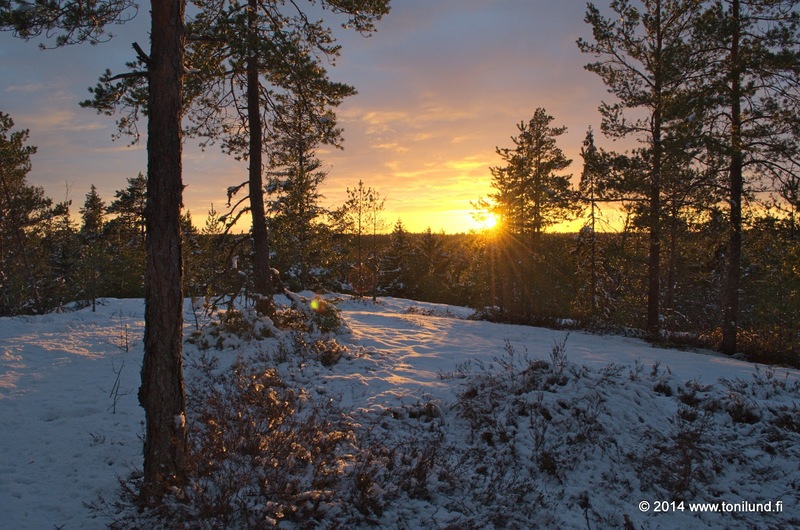 The beginning of March was very springlike. 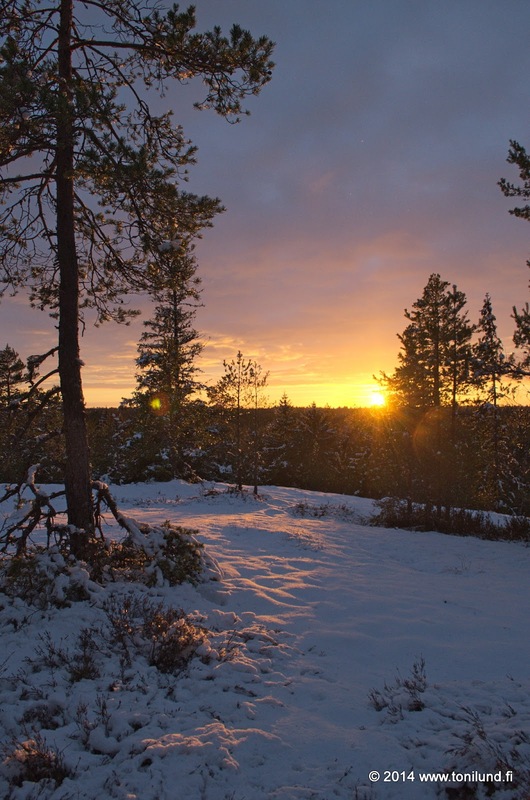 Daytime temperatures were as high as +10°C and sun was shining at last. But the spring never comes here that easily, and usually there is always some kind of backlash. 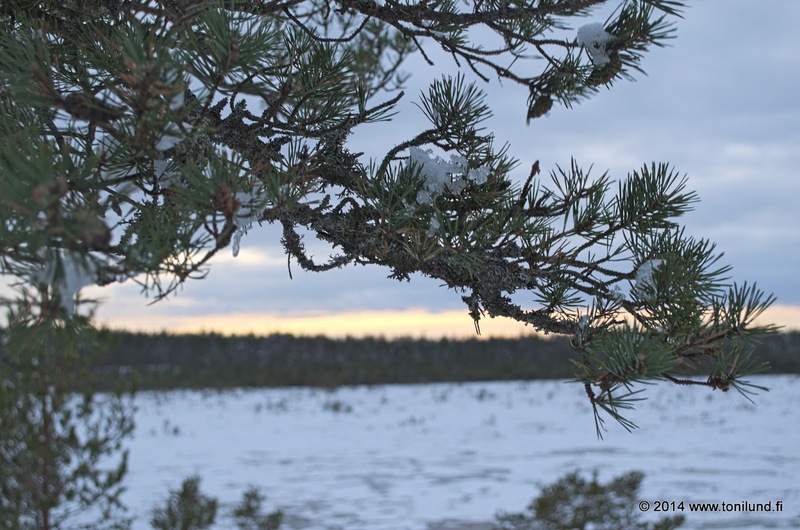 In the middle of last week, news headlines were about the weather to turn wintry even in Southern Finland. 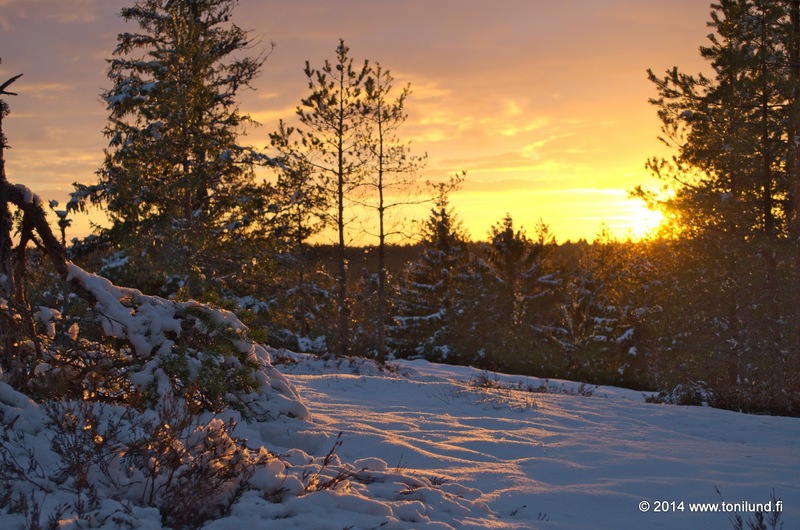 First snow on Saturday, and then colder temperatures for the next week. Naturally I was getting excited, and thought that this would be brilliant timing for probably the last chance of winter overnighter. And exactly that happened! The usual suspects were on the move again, this time I was joined by Peter and Juha (JJ). 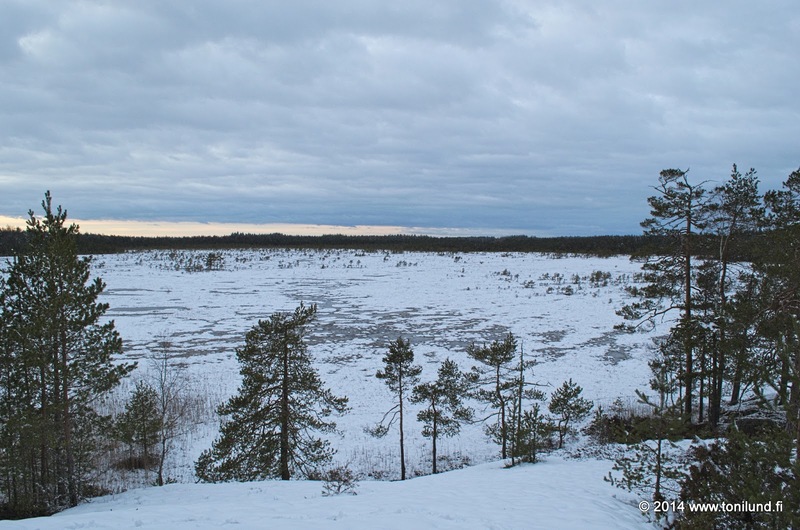 The destination was this time the Wilderness of Marttila. 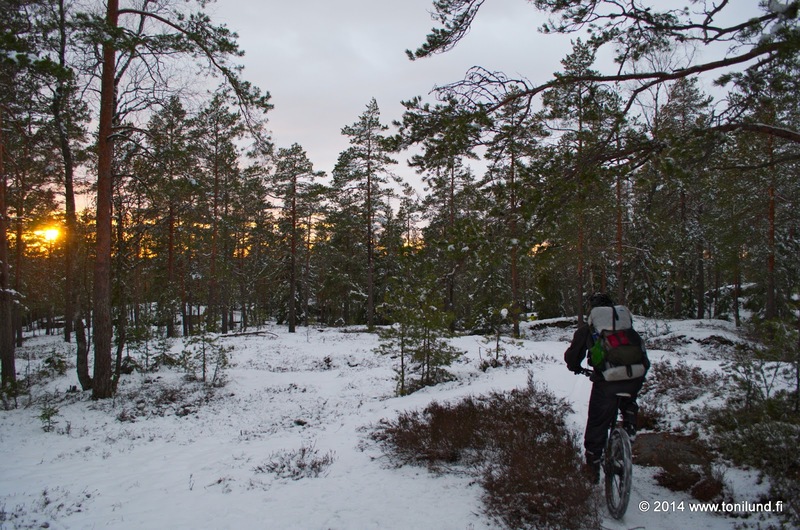 We have been so many times at the Onnenperänrahka shelter that we planned to try the lean-to of Lotikonkellari and start earlier in the afternoon so that we could ride some trails when there is still light. 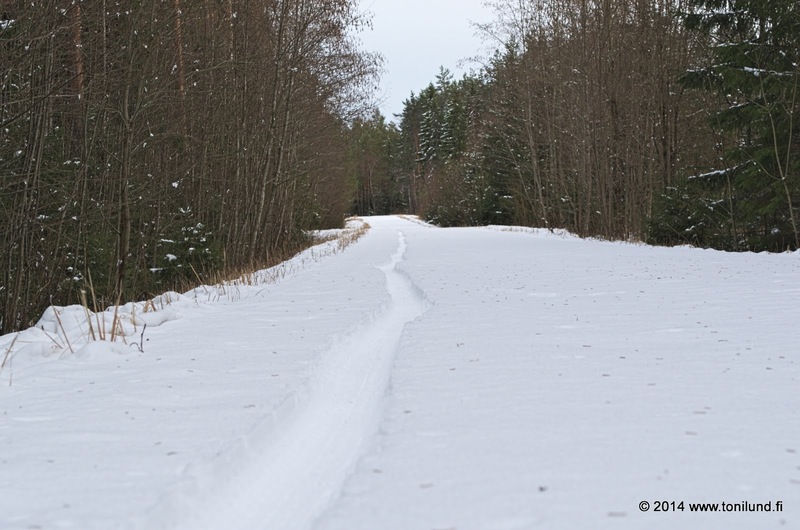 The snow was fairly wet and soft, and it was tough going. Soon I met Juha and Peter. 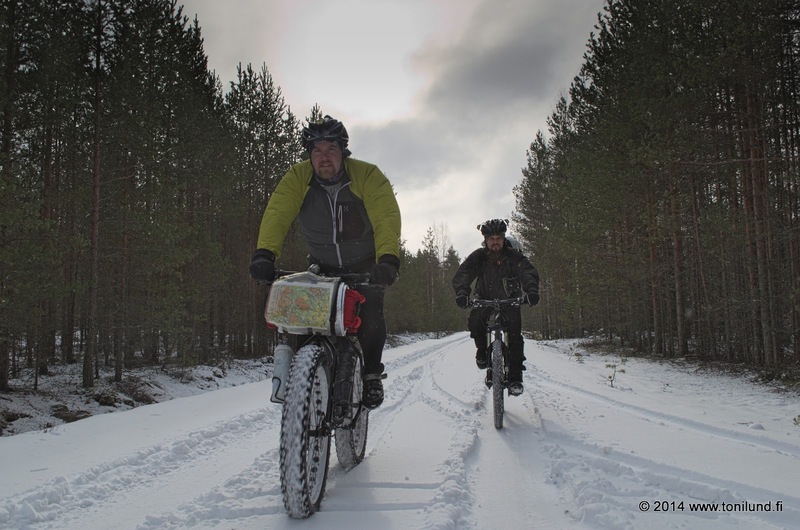 We decided to ride first to the Lotikonkellari to check out the state of firewood. 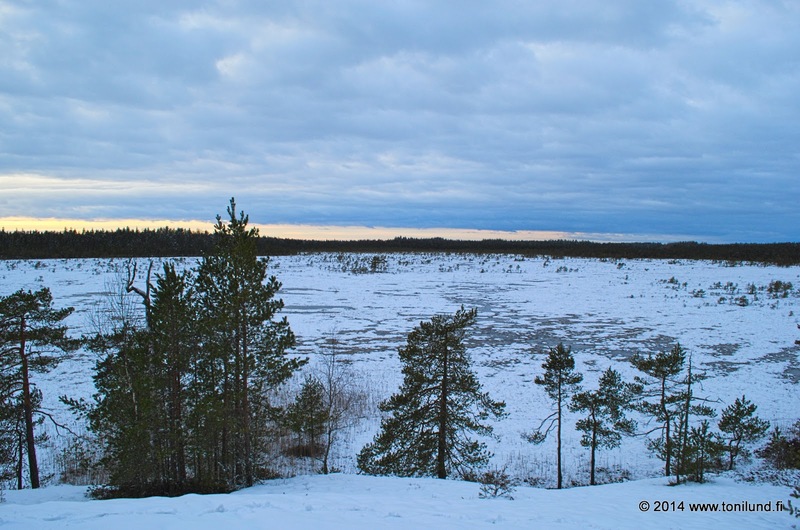 The route is really beautiful, along the Juomakivenrahka mire. 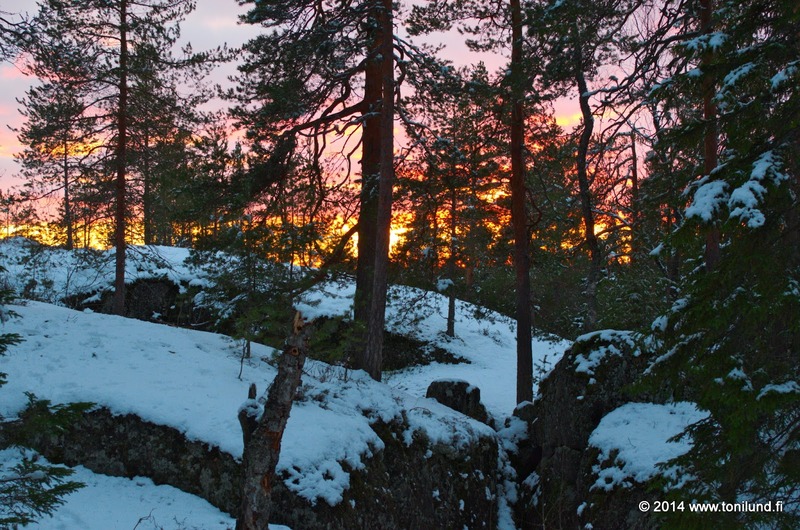 As we reached Lotikonkellari, the sun was setting. We took a short break there. The mood was fantastic! 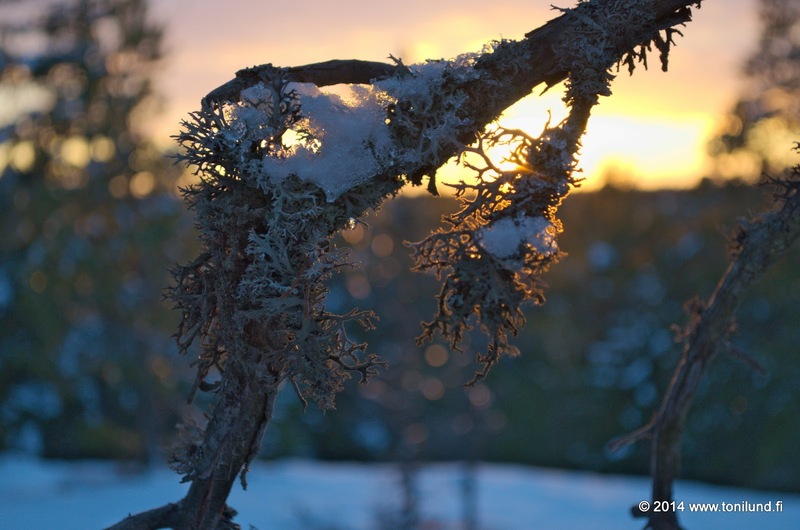 Late winter feeling with the sun, and strong wind. 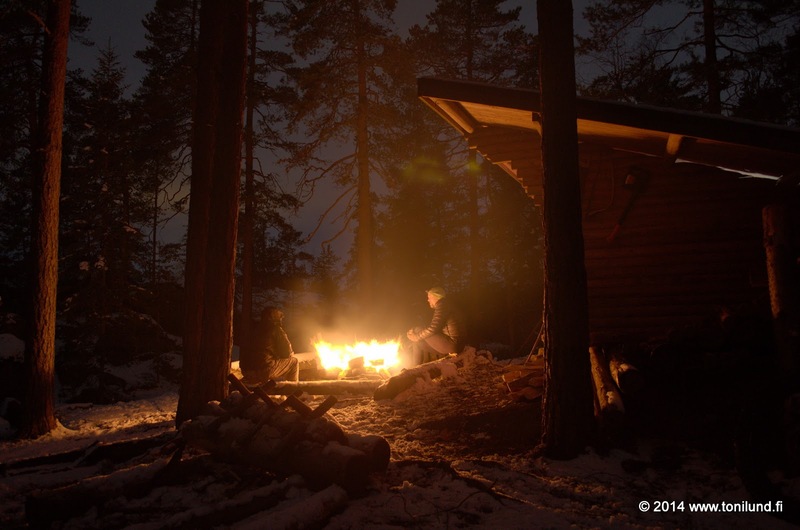 No doubt that this is the best shelter location at Marttila! 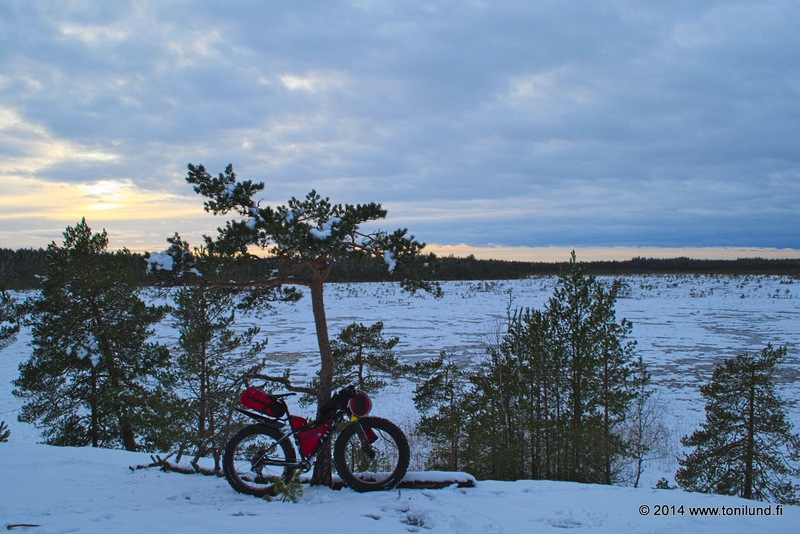 After sunset, we decided to ride to Palainen and then possibly to Hirvikallio. 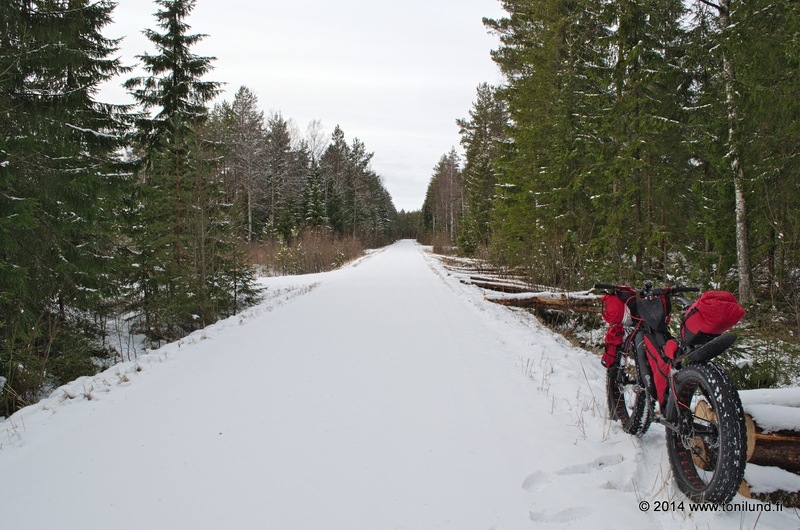 We decided to skip Hirvikallio and ride back to Lotikonkellari, as we were getting hungry. 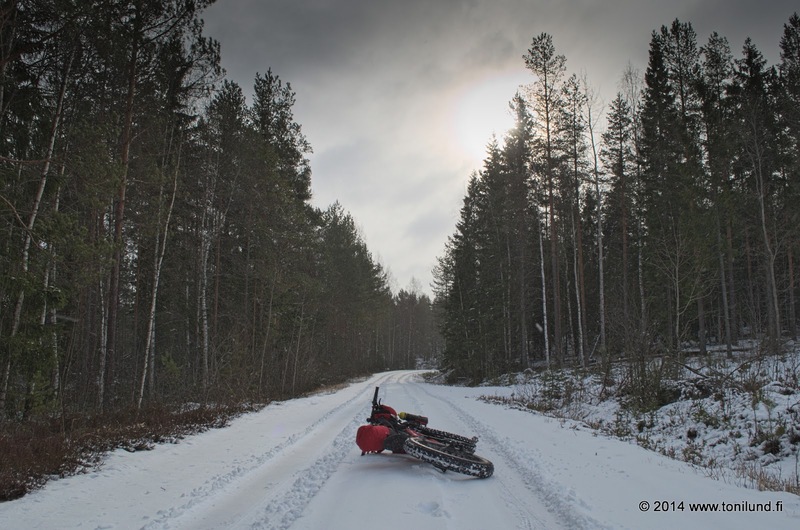 On our way, as I was riding at the front, I crashed heavily on a small bridge over a ditch. The ditch was mainly on ice, so I didn't get wet, but I hit myself very hard. My right hand was in pain but otherwise I was ok. The right crankarm of my bike was bent and the rear wheel disengaged. 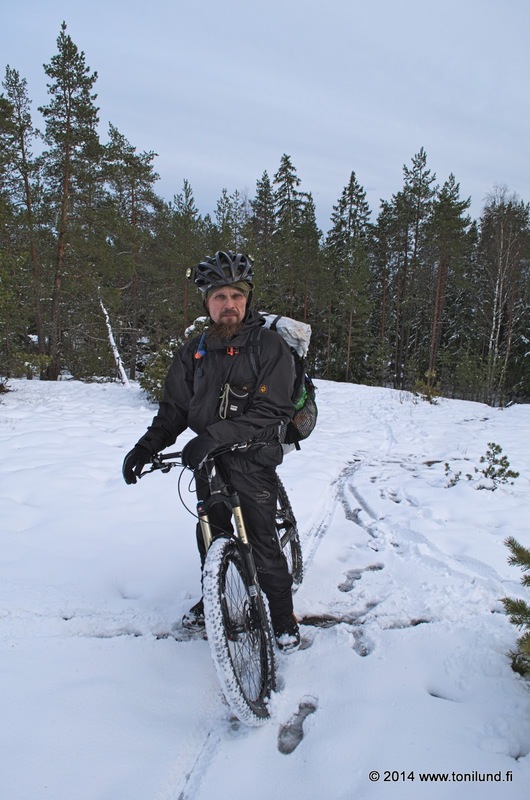 Juha helped to put the wheel back on the bike. The crankarm was so bent that I couldn't ride the bike, so I pushed it to the shelter. We were quite close anyway. 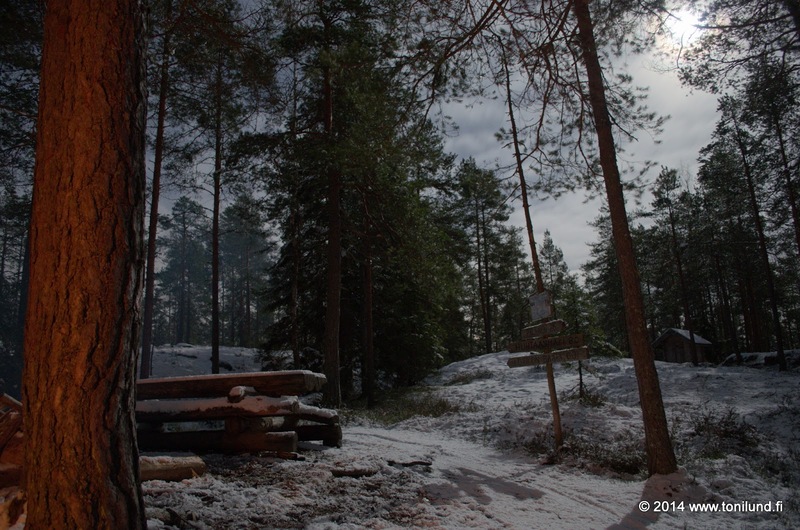 Juha and Peter started to make firewood and start the campfire. The wind was very strong now. But the night was not good. Right after I got in to sleeping bag and tried to sleep, my right arm started to really hurt. I changed my position several times during the night but it didn't help. In the morning the arm was really painful. 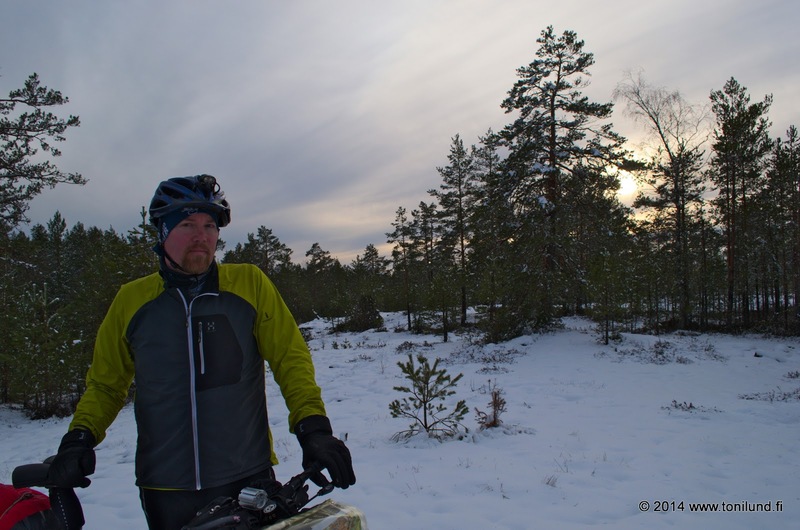 Peter helped me to pack my gear, and carried my bike down to the trail. 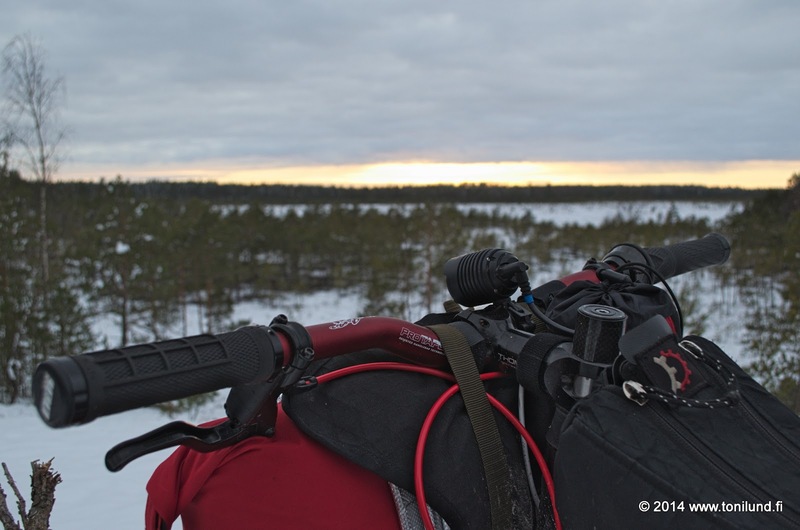 In the evening, we were able to bent back the crankarm slightly, so I could ride to the cars of Peter and Juha. Meanwhile, the guys rode via the other route. Riding didn't hurt too badly. Soon Peter and Juha arrived. On the car trip back home, we saw a swarm of swans on a river. 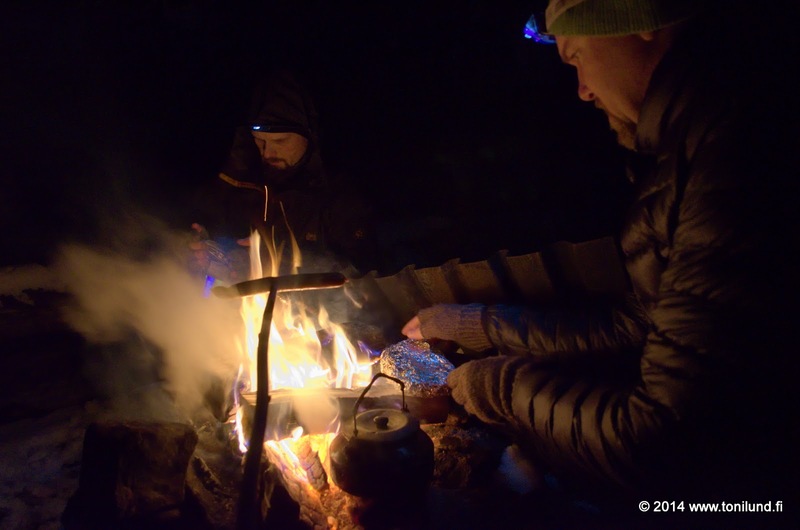 Despite the crash, this was excellent overnighter after a poor winter. My arm is still in pain but it looks like nothing is broken. And my 9:ZERO:7 will be repaired next week with new crankarms. Thanks Peter and Juha for the company. 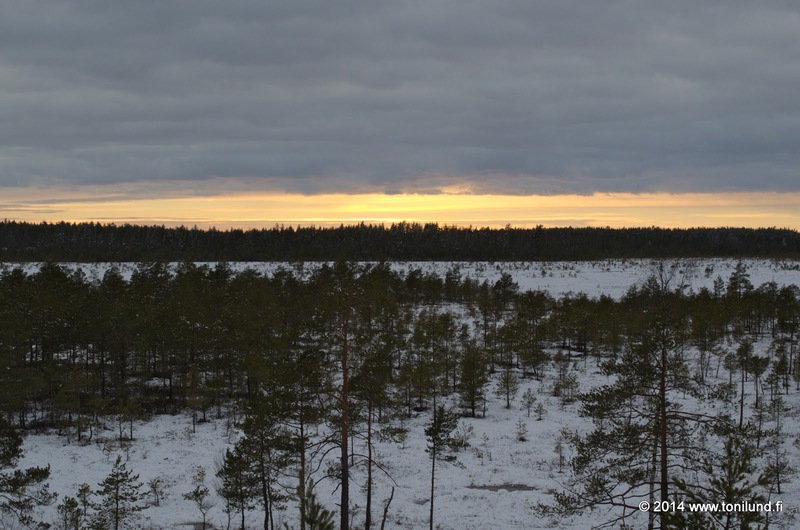 Check out Peter's report here, and Juha's photos here.